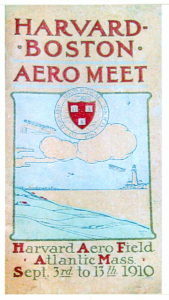 The Harvard-Boston Aero Meet of 1910 was the first international air-meet of its kind ever held in the United States, and became an aviation record setting event. Some newspapers touted it as “the greatest meet of its kind ever held in America”, and it was, for it eclipsed the first international aviation meet that was held in Reims, France, the year before. 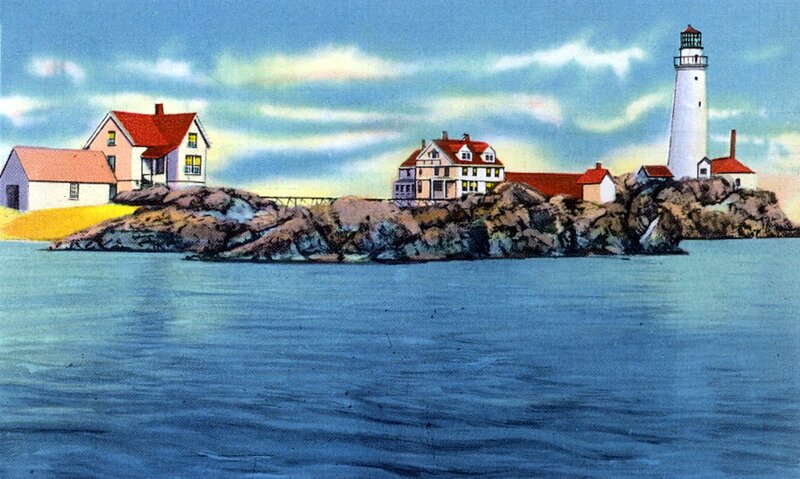 Although it was advertised as the “Harvard-Boston Aero Meet”, the event was actually held on a 500 acre tract of land on the Squantum Peninsula in the neighboring town of Quincy, but some newspapers reported the location as being in “Boston”, “Squantum”, “Atlantic”, or “Soldiers Field”. The air meet was originally scheduled to be held from September 3rd thru September 13, but was so successful that it was extended for two additional days. Preparations had been made months before the start, with advertising and promotion, vendors, and the construction of grandstands capable of seating 150,000 people, and parking areas which could accommodate up to 10,000 automobiles. The event came about through the efforts of the Aero Club of New England and the Harvard Aeronautical Society of Harvard University. The following newspaper article which appeared in The Bridgeport Evening Farmer, (Bridgeport, CT.), on May 24, 1910, indicates that during the early planning stages there was some disagreement between the various aero clubs across the country. New York, May 24. – When the board of governors of the Aero Club of America meets this afternoon to decide formally upon a place for holding the international aviation contest and to award the contract for financing the meet, it is not likely that representatives of the various aero clubs throughout America will be present following the split which has resulted in the foundation of a rival aero club. The split will probably be followed by new complications in the patent suits of the Wright Brothers which were thought to have ended when the Aero Club of America recently recognized the validity of the Wrights patents and agreed that no aviation meet should be held in America unless it consed (newspaper word/spelling) by the Wright company. The clubs which were formally affiliated with the Aero Club of America and which have now broken away to form the American Aeronautic Association are the aero organizations of Indianapolis, St. Louis, Baltimore, and Harvard, Illinois, Washington and Buffalo. The Aero Club of America declares that the association of out-of-town clubs will in no way affect the international aviation meet to be held in October, plans for which will be completed this afternoon. The insurgents say they will in their turn hold such aviation meetings as they see fit. This will surely be followed by legal complications for the Wright company would immediately seek to enjoin any meeting held without license. If the courts uphold the validity of the Wright patents as some have done heretofore, opposition would be useless. An unrelated dispute arose between two of America’s top aviators, Glenn Curtiss and Charles Hamilton, which was reported in the New York Tribune, on August 2, 1910, page 2. Aviators have highly sensitive organisms, and when they fall out there is not much use in a third party trying to reconcile them. Curtiss and Hamilton have not smiled when speaking of each other for several weeks now. 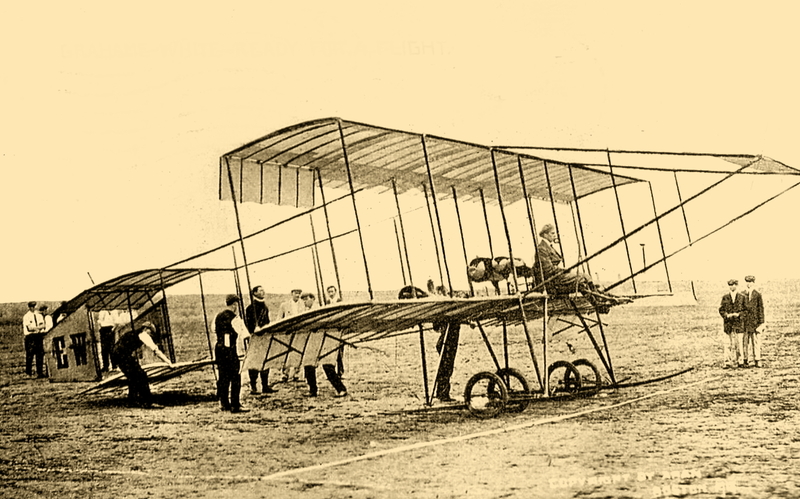 “You can’t fly at Harvard in any machine other than the one I make at Hammondsport,” says Curtiss to the bull-headed younger man. “I won’t fly anywhere unless in a machine not made by Curtiss,” replies Hamilton to one and all. And then the third party, the national council of the Aero Club of America, tried to calm the breezes and invent some means whereby both aviators could make money while utilizing the same sky. The council met at 3 p.m. yesterday and worked hard until 7 o’clock. It was decided that that body could sanction only an aeromatic show that was open to any licensed and duly qualified aviator. The action settled the right of Hamilton to fly at Harvard, without of course, involving the council concerning the alleged contract existing between Curtiss and Hamilton, which Curtiss maintains, binds Hamilton to fly the former’s type of machine for a stated period. Although Hamilton has not yet been “licensed” by the Aero Club, no doubt is prevalent of his ability to qualify. It would, in fact, be a serious undertaking for any aviator in America to duplicate the things that Hamilton might well be expected to do while proving that he knew how to be a pilot. Curtiss was appointed by the club some time ago to “observe Mr. Hamilton for three flights,” so the officials might be guided in giving him a license. Curtiss has requested that the club waive the triple observation and issue the license any way. All this then points to the probability that if Hamilton does not fly at the Harvard aeronautic meet, September 3 to 13, it will not be because he is short on qualification. But it does not lessen the strain on a lot of persons as to whether Curtiss and Hamilton will fly at Harvard together or separately, or whether Harvard will have any aeronautical meet. The action of the council yesterday doesn’t help Curtiss or Hamilton to attain equilibrium. It is said by Curtiss’s manager, J. S. Fanciulli, who is also secretary of the executive committee of the council, that Curtiss will not fly at Harvard if the aero club of that learned institution consents to Hamilton’s appearance in a machine not named for his principal. Hamilton said last night after the conference that he would not go to Harvard or take any steps leading toward Harvard unless he was invited – he might add, urged. It is all most unsatisfactory and befuddled to many interested enthusiasts. Israel Ludlow was Hamilton’s attorney at the meeting yesterday. Fanciulli was invited to retire temporarily as secretary, but was commended in a resolution later. It is said he will be retained by the council in that capacity, and will also manage the making of exhibition contracts for Curtiss. “I am at a loss to explain the action of the National Council of the Aero Club of America,” said President A. Lawrence Rotch of the Harvard Aeronautical Club, when told to-night at his summer home in Northeast Harbor, Me., of the council’s step in deciding to withhold sanction of the Harvard aviation meet in September unless the entry of Charles K. Hamilton is accepted. President Rotch declined to say whether or not the meet would be held regardless of the official sanction, saying it was a matter for the directors to consider. Apparently all matters were settled for the aero meet took place as scheduled, and Charles Hamilton and Glenn Cutriss participated. Initially balloons of all types were going to be allowed to participate in the aero meet, and plans were in the works for constructing a hydrogen plant, however, in mid-August it was announced that balloons would not be allowed so as not to detract from the airplane flying contests. The Harvard-Boston Aero Meet drew the world’s top airmen of the day. 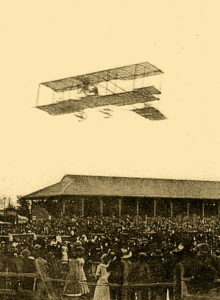 One particular incentive was a $10,000 cash prize offered by the Boston Globe newspaper for the fastest flight by “any kind of flying machine from Soldiers Field to Boston Light” and back, without stopping. The distance from the airfield to the light was reported to be a little more than 12 miles which meant an aircraft had to cover almost 25 miles. 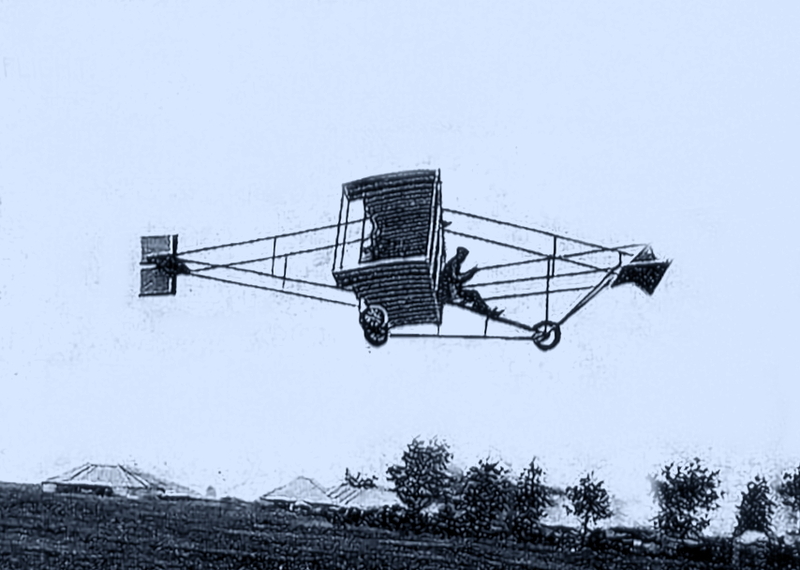 This might seem mundane in today’s world, but aviation technology was still in its infancy in 1910, and a pilot had to be confident of his abilities and his machine to attempt such a “long distance” water crossing. And besides the fame that would go to the winner, ten-thousand dollars was a fortune. This contest was open to anyone, and contenders were welcome to try their best efforts each day of the meet 12 noon and 7 p.m. Furthermore, a contestant would be allowed to fly the course as many times as they dared. In addition to the Globe’s prize money, cash prizes totaling $50,000 were to be awarded to the winners of other contests which included “duration flights” to see who could stay in the air the longest; bomb dropping contests, where points would be scored for accuracy; “get away” contests, to see who take off in the shortest distance; and “accuracy in landing”, to see who could land closest to a designated spot on the field. These contests were open to all types of mechanical aircraft. M. Didier Masson, Vendome aeroplane. C. Graham-White, Farman biplane and Bleriot monoplane. William M. Hillard, Herring-Burgess biplane. J. M. Allias, Harvard biplane. 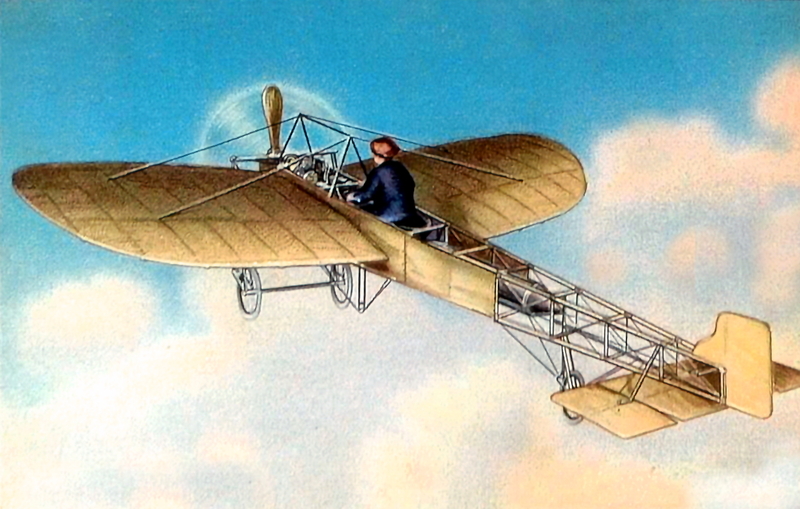 John G. Stratton, Burgess-Curtiss aeroplane. Ernest P. Lincoln, Clifford B. Harmon, Captain Thomas Baldwin and Jacques De Lesseps. For the purposes of exhibition only, Cromwell Dixon also will appear in a dirigible balloon. 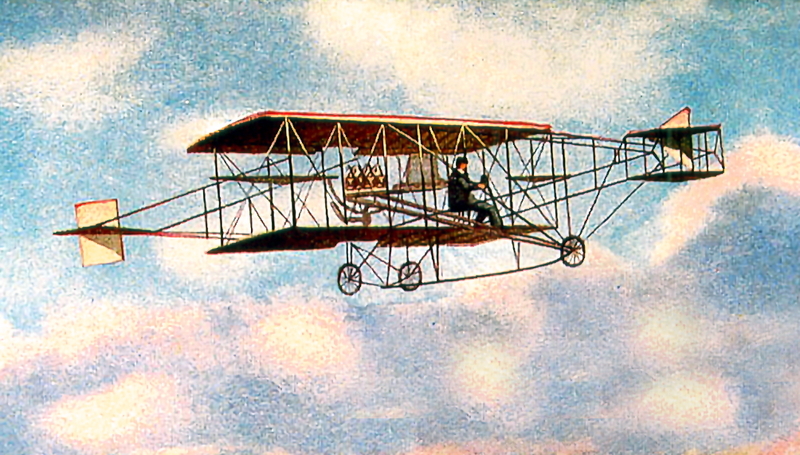 A vintage postcard view of a Bleriot monoplane. As the aviators arrived in Boston in preparation for the meet, their aircraft were secured in tents at the airfield. On August 26 disaster struck for two of them when a severe storm came through the area and severely damaged two planes; the Harvard I, belonging to the Harvard Aero Club, and the Pfitzner monoplane owned by Horace Kearney. Both aircraft had their canvas skins shredded and the wings from Kearney’s monoplane were pulled away. Meanwhile, aeronaut Cromwell Dixon, stated to the press that on Tuesday, August 30, he planned to fly his dirigible airship from Boston to Plymouth, Massachusetts, a distance of more than forty miles, and landing as close to Plymouth Rock as possible. He then planned to retrace Paul Revere’s historic ride via the air, and circle the Bunker Hill Monument before continuing out over Boston Harbor where he would drop imitation bombs on naval vessels. Cromwell Dixon was born July 9, 1892, and by the age of 14 had built his own airship. In September of 1910, at 18, he was one of America’s youngest aviators. He died in an aviation accident on October 2, 1911, in Spokane, Washington. 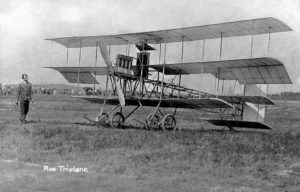 One aircraft that drew a great deal of attention was a tri-plane belonging to aviator A. V. Roe, (Alliott V. Roe, 1877-1958), which was the first of its kind seen in America. It was reported that his competitors were anxious to see how it would perform against their biplanes and monoplanes. It also was announced that there would be a woman aviator taking part in the meet, 21-year-old Miss Emily T. Willard, of Melrose, Massachusetts, sister of well known aviator Charles F. Willard, hailed by the press to be one of America’s most daring aviators. By September 1st the number of aviators registered to compete in the aero meet had risen to twenty-two. The following in an excerpt of an article that appeared in The Salt Lake Tribune, (Utah), on September 2, 1910, page 10. The evening before the aero meet was to begin, English aviator Claude Grahame-White made a practice flight around the airfield. The following morning, people began to gather at the field before sunrise to be sure they obtained prime viewing locations. Not wanting to disappoint the early risers, Grahame-White started his aircraft and took off to make a six mile flight circling the field, thus unofficially opening the meet. The flight was made at an average height of between 150 and 200 feet, and took a total time of 7 minutes and 1.60 seconds. Later in the day the first accident occurred when Clifford B. Harmon’s biplane sank into soft dirt during take-off. Some of the wet dirt stuck to the wheels of the plane, upsetting the aircraft’s aerodynamics and causing it to crash into a marsh from an altitude of forty feet. Although the plane was damaged, Harmon was not hurt. About noon time a drizzling rain began to fall sending some of the crowds home, but those that chose to remain got to see Claude Grahame-White make another three-lap flight around the field. The five and a quarter mile flight was accomplished in 6 minutes and 5 seconds, which was the best speed of the day. At 6:30 p.m., Glenn H. Curtiss made some practice flights in his airplane. Among the spectators on opening day was John Trowbridge, the Cambridge, Massachusetts author who in 1869 penned the famous poem, “Darius Green and His Flying Machine”. It was reported that despite his writings, he’d never seen a flying machine, and took great interest in the aircraft. On September 4, Claude Grahame-White took first place in all five classes. He also gave several exhibition flights where he performed hazardous aerobatics. On one flight he carried as a passenger a Miss Campbell of New York. With Miss Campbell aboard he circled the field twice and then performed a 200 foot aerial slide pulling out a mere ten feet from the ground before coming down to land. It was reported that the best time of the day (around the airfield) was made by Grahame -White. This time he covered 5 and 1/4 miles in six minutes, one second with a Bleriot airplane. White’s distance record of the day was 45 miles 617 feet, on which trip he was in the air for one hour and 15 minutes, 7 seconds. On that same day, Charles F. Willard took Miss Eleanor Ladd of Boston on a flight. She worked for a Boston newspaper, and was reportedly the first newspaper women in America to fly in an airplane. Apparently it wasn’t until September 7th, five days into the meet, that any of the airmen attempted to win the coveted $10,000 cash prize offered by the Boston Globe. The following details were reported in the Burlington Weekly Free Press, (Vermont), on September 8th. “On September 7th Claude Grahame White became the first competitor to try for the Boston Globe’s 10,000 prize money by flying to Boston Light and back in his Belriot monoplane. The established course required two trips to the light and back as well as some twists and turns which brought the total miles to be covered to 33. Grahame-White accomplished this in 40 minutes 1 and 3/5 seconds which set the mark for all other contestants to beat. While passing over the water toward the light at an altitude of 1,000 feet, three U.S. Navy torpedo boats, Stringham, MacDonough, and Bailey, gave chase, but couldn’t keep up with the speed of the airplane. On September 8th, Alliott V. Roe took off in his triplane and circled the field once before his aircraft was hit by a strong gust of wind and crashed near the grandstand from an altitude of about twenty-five feet. As he was assisted from the wreckage he declared that he wasn’t seriously hurt, but the triplane had to be removed in sections. William Hillard then made a similar flight circling the field at about thirty-five feet in the air without incident. Ralph Johnstone, Walter Brookins, and Claude Grahame-White, competed for the altitude record. 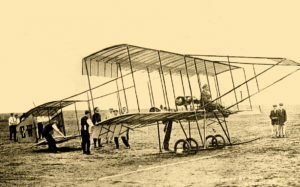 Wilbur Wright announced that his aircraft would not be participating in the speed contests, stating that his airplanes were built more for better fuel economy, carrying ability, and durability. Augustus Post made several short flights in his Curtiss biplane. On September 9, Claude Grahame-White was piloting his Farman biplane when he crashed while attempting to land, crumpling the right wing and damaging the chassis. Grahame-White, however, was not hurt. The accident was due to the aircraft being caught in a strong gust of wind. The accident occurred at the end of a duration flight contest. Ralph Johnstone was forced to land during the same contest when the motor of his Wright biplane began to misfire. At the time Grahame-White had his accident, he had exceeded Johnstone’s time by four minutes, and would have stayed up longer, but was signaled to land by Mr. McDonald, his manager, due to the wind building up. Grahame-White had flown 33 miles and 1,420 feet, compared to Johnstone’s 28 miles, 4,557 feet. Grahame-White already held the world’s record for distance required for take-offs; 20 feet 9 inches. Prior to the accident he’d tried to beat his own record but was unsuccessful. He did, however, manage a low score of 26 feet 11 inches which put him in first place for that competition at the aero meet. September 9th was also Governor’s Day at the meet, and Massachusetts Governor Eben S. Draper was on hand with several of his staff. Bomb Dropping Contest: Claude Grahame-White, 75 points; Glenn H. Curtiss, 25, Charles F. Willard, 13. The standing of the contestants in the other four events in which points were awarded were as follows: Claude Grahame-White, 30.5 points; Ralph Johnstone, 17; Walter Brookins, 10: Charles F. Willard, 7: Glenn H. Curtiss, 6.5. On September 10, Wilbur Wright and Glenn Curtiss competed in the bomb dropping contest by dropping bombs at a mock-up of a battleship. 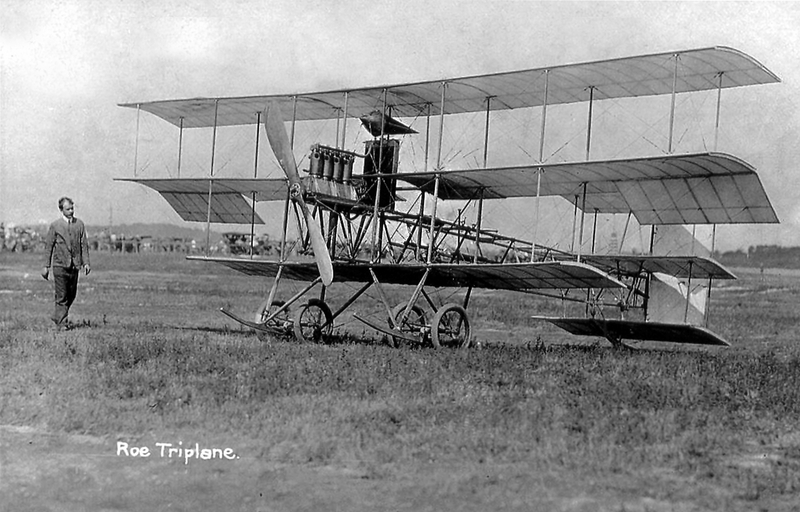 Curtiss flew his new biplane dubbed “The Flying Fish”. Walter Brookins attempted to best his own altitude record of 6,160 feet but was unable to do so. He did however set a record for airplanes equipped with skids instead of wheels when he landed his biplane 12 feet 1 inch from a given point on the ground in the accuracy contest. Ralph Johnstone set a new duration record by remaining in the air two hours, three minutes, and 5.25 seconds, covering 62 miles and 3,756 feet. On September 12th it was reported that one world’s record and two American records had been broken. Ralph Johnson set two new records, one in accuracy landing, and the other in distance. He remained airborne for 3 hours, 4 minutes, and 44 seconds, which broke Clifford Harmon’s record of 1 hour and 58 minutes. Johnstone’s flight covered 97 miles and 4,466 feet, breaking Harmon’s old record of 90 miles. Upon landing Johnstone came down almost on top of the designated mark on the field setting a new world’s record. 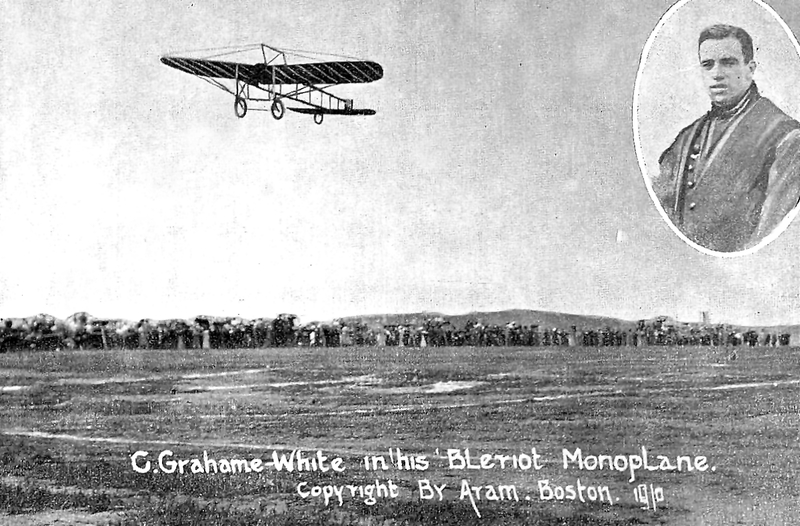 Claude Grahame-White flew twice to Boston Light in his Belroit monoplane covering a distance of 33 miles in 34 minutes. What was mentioned as “a feature of slightly less interest” involved a flight made by Charles F. Willard who took along army lieutenant Jacob E. Finkel, a rifle sharpshooter. As Willard circled the airfield, Finkel fired shots from the airplane at targets on the ground, hitting them more often than not. The “experiment” was considered “highly satisfactory”. On the final day of the meet, it was determined that the overall champion was Claude Grahame-White. He’d not only won the $10,000 crash prize from the Boston Globe, but also won first place in four other events, and second place in three others, earning an additional $22,000 dollars. Ralph Johnston won three first prizes and one second prize for at total of $5,000 in winnings. Johnston would be killed a few weeks later in a plane crash in Denver, Colorado, on November 17, 1910. Walter Brookins won two first place prizes and one second, earning himself $4,250. Glenn Curtiss won the second place prize for speed and took home $2,000. Charles Willard won $50 for second place in take-offs. Clifford Harmon of New York reportedly won “all the amateur prizes” but there was no mention of what the amounted to in prize money. Although regular prize competition for all events had been closed on the last day, the meet had been so popular that it was decided to allow it to continue for an additional two days. The following day, September 14, a bomb dropping contest from an altitude of 1,800 feet was held, and trophy’s were awarded the winners. 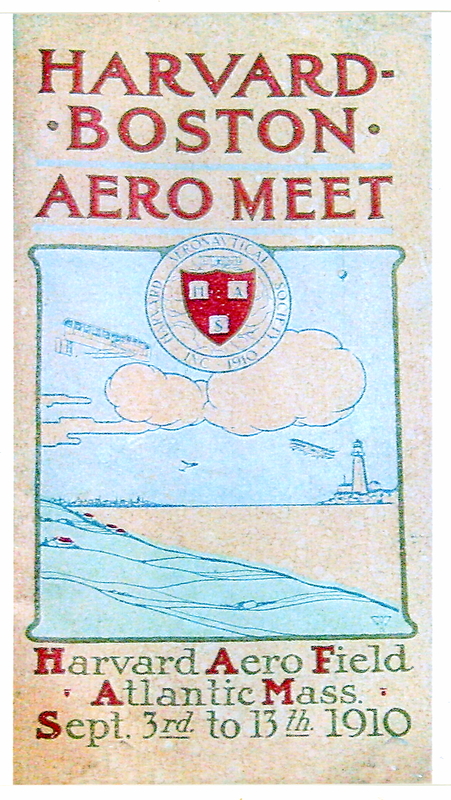 Two more Boston aero meets were held at the same airfield, one in 1911, and the other in 1912. It was at the 1912 aero meet that well known aviator Harriet Quimby, and William Willard, the event’s organizer, were killed. New York Tribune, “Harvard Meet In Danger”, August 2, 1910, page 2. Vermont Phoenix, “Globes $10,000 Prize”, August 5, 1910, page 3. New York Tribune, “No Balloons At Aero Meet”, August 18, 1910, page 3. New York Tribune, “Leading Aviators Enter”, August 20, 1910, page 3. New York Tribune, “Wind damages Aeroplanes”, August 27, 1910, page 4. The Calumet News, (Calumet, Mich.), “Big Aviation Meet In Boston”, September 1, 1910. The Salt Lake Tribune, (Utah), “Twenty-two Aviators In Harvard-Boston Meet”, September 2, 1910, page 10. The Bridgeport Evening Farmer, (Conn.) , “English Aviator Makes Six Mile Flight In Boston”, September 3, 1910, page 2. Los Angeles Herald, “Big Flock Of Men-Birds Flies At Harvard Field”, September 4, 1910. The Bemidji Pioneer, (Minn.) “Aeroplane Cuts Capers”, September 6, 1910. The Washington Times, (Wash. D.C.), “Current Tumbles Amateur Aviator”, September 8, 1910, Last Edition, page 4. Burlington Weekly Free Press, “English Airman Flies To Light”, September 8, 1910, page 12. The Topeka State Journal, (Kansas), “Wrecks his Machine”, September 8, 1910, page 3. New York Tribune, “Smash At Aero Meet”, September 10, 1910, page 4. Los Angeles Herald, “Big Aeroplane At Boston Falls In A Heap On Aviation Field”, September 10, 1910, page 13. New York Tribune, “New Endurance Record”, September 11, 1910, page 7. Los Angeles Herald, “Johnstone Sets Three New Records”, September 13, 1910, page 6. Palestine Daily Herald, (Palestine, TX. ), “Records Crumble”, September 13, 1910. San Francisco Call, “English Aviator Wins Blue Ribbon”, September 14, 1910, page 1. Norwich Bulletin, (Conn.) “Continue For Two Days”, September 14, 1910.